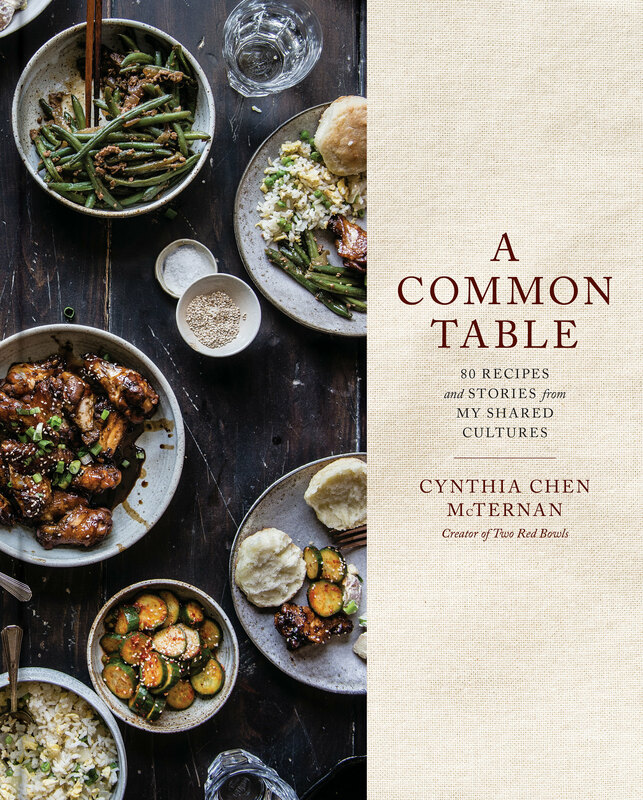 The main reason I didn’t simply try others’ recipes for this was because I wanted to figure out a recipe that yielded only a half-batch of six cupcakes, not twelve or two dozen — though I ended up making more than two dozen by the time I was happy with the recipe. Go figure. (It’s a very good thing my dad likes pumpkin, because he had these every day when I was home thanks to my experiments.) Baking for two means that I need recipes that I know are just as delicious as large-scale ones, but won’t be hanging around for so long that we get sick of trying to finish them all. 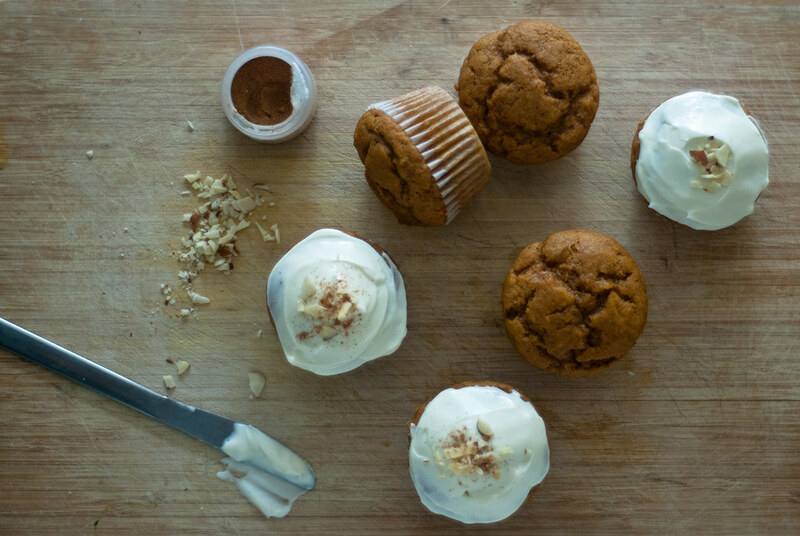 Pumpkin muffins, with frosting. Take one. The first recipe I tried (above) was an amalgamation of several pumpkin cake recipes I found, which I then divided by three. I don’t really know why I thirded it — maybe the ease of the numbers — but it gave me … seven cupcakes. Sigh. (Bowl #2 called it a “skinny baker’s dozen.”) And, though they were delicious, the height of the domes, the crackled top, and the somewhat dense consistency reminded me more of pumpkin muffins than cupcakes (I frosted them anyway). Less flour, pumpkin, sugar, too much leavener. Flat tops. Take three. Then came three or four batches where I attempted to bring the recipe down to six cupcakes. I played around with the pumpkin-to-flour ratio, the amount of sugar, the amount of oil, and finally the leaveners. Each time was almost right, but the leaveners in particular made the cupcakes a bit too delicate, with a very flat top that tended to spill over and stick to the cupcake pan. Lesson learned — too much baking soda and baking powder can cause your cakes to rise too quickly, run over the edges, and stay flat, without forming domes! Finally, I arrived at this version. The cake is wonderfully moist, but not dense; the crumb is light, but still substantial; the tops are just slightly domed, but smooth and not at all like muffins. And it’s just the right balance of spice and pumpkin, in my opinion. 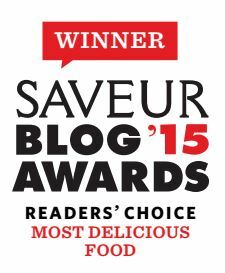 (OK, a small admission — there’s still a little extra batter, but if you’re like me and fearless in the face of salmonella, well, then there’s just the right amount.) 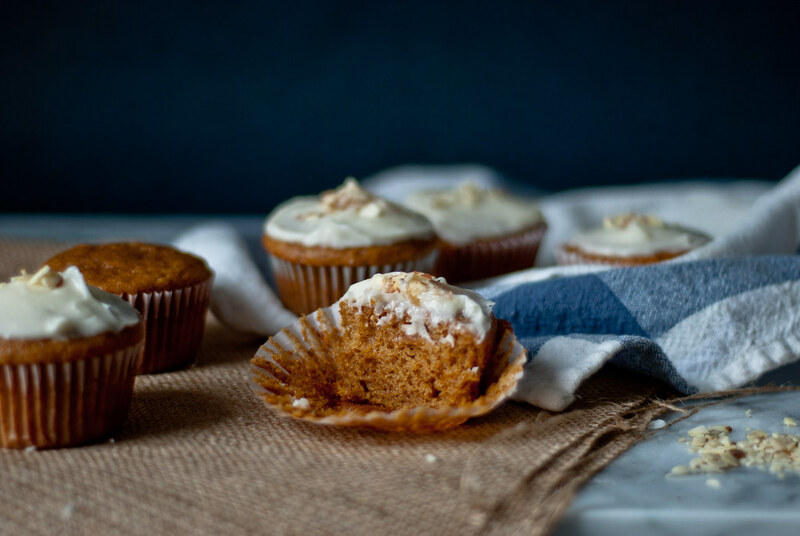 Oh, and I can’t forget about this maple cream cheese frosting, which is just incredible — it’s based on the Smitten Kitchen recipe, with just a bit more confectioners’ sugar for extra structure. Please try these, I think you’ll really like them if you do! 1. Preheat your oven to 350 degrees and line a 6-cup muffin tin with cupcake liners. 2. In a large bowl, vigorously whisk the egg and sugar together until creamy. Add vegetable oil, Greek yogurt, pumpkin, and vanilla extract, and whisk again until smooth. 3. In a separate bowl, sift together flour, baking powder, baking soda, spices, and salt. Add the flour mixture to the pumpkin mixture and mix until incorporated, taking care not to overmix. 4. Fill liners to 2/3 full or less for these. I filled mine about 3 tablespoons of batter each, using a 1/4 cup measuring cup. You will have a little bit of extra batter left. Bake for 18 minutes, or when a toothpick inserted comes out clean, and tops spring back when touched. will yield just enough for six cupcakes (about 1/3 cup of frosting). Easily doubled if you want to pipe the frosting instead. 1. If mixing by hand, whisk together cream cheese and butter first until very smooth. If you’re mixing by hand, it will greatly help if the cream cheese and butter are quite soft beforehand. Add in the sugar next and whisk vigorously until smooth. Last, add the maple syrup or molasses and whisk again until incorporated. You may need to add a bit more confectioners’ sugar after you add the syrup. 1(a). If you’re lucky enough to have an electric mixer or stand mixer, just throw everything into a bowl and beat on high speed until fluffy. Ta-da! Note: I’ve since tried this maple brown butter cream cheese frosting by Tutti Dolci and it blew my mind — you have to try this. I devoted a whole post to it even though (1) it’s not my recipe and (2) the pictures were crappy. It’s really, really good. 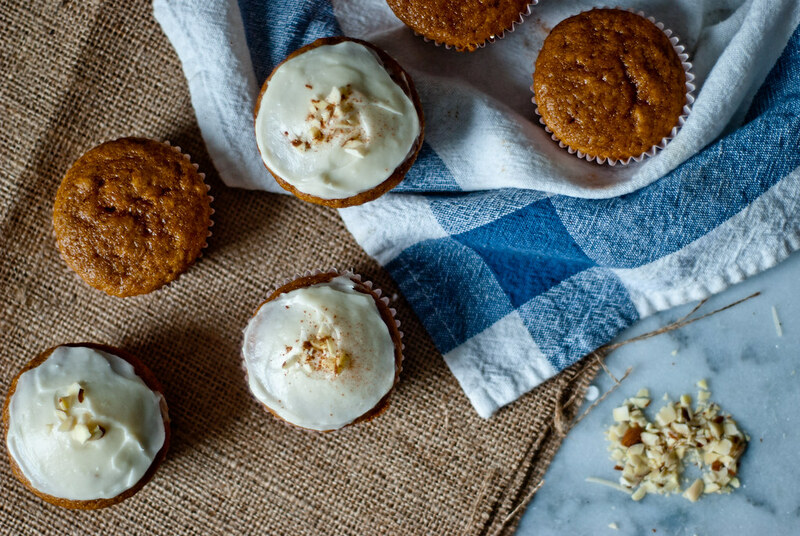 I love that you scaled the recipe down because I experience the same issue all the time – and as much as I want to, I can’t eat 12 cupcakes alone! Your comments are always so lovely, Erika! 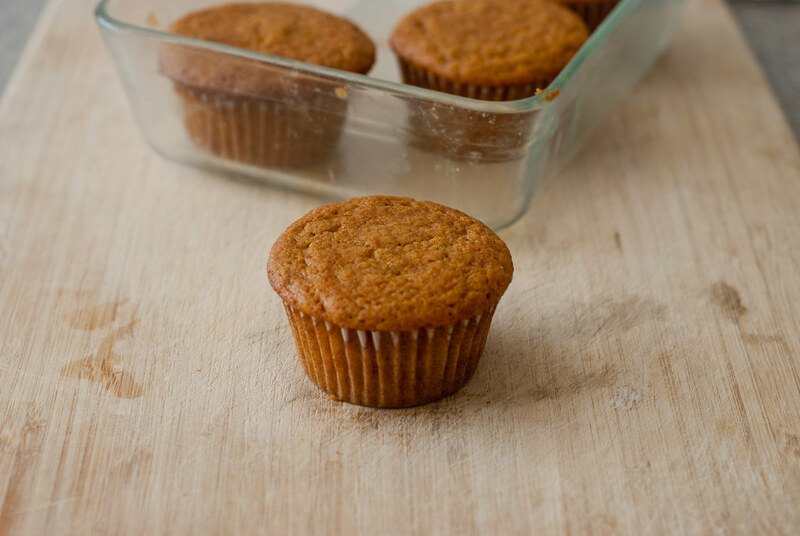 🙂 I love that you asked for this muffin recipe, it makes me feel like all that pumpkin wasn’t for nothing (well, nothing plus my dad’s tummy!) And I really did love it as a muffin! Moist but nice and substantial. If you don’t mind the awkward seven-muffin yield, I believe this is what I used (um, LOVE googledocs and its revision history!) with the same method as above. Wait–yum!! Idk how I’m just seeing this now, but thanks so much for posting the recipe!! I’m excited to try these!! You’re nothing if not determined! I love that- finally getting to a perfect recipe is the greatest feeling, right? 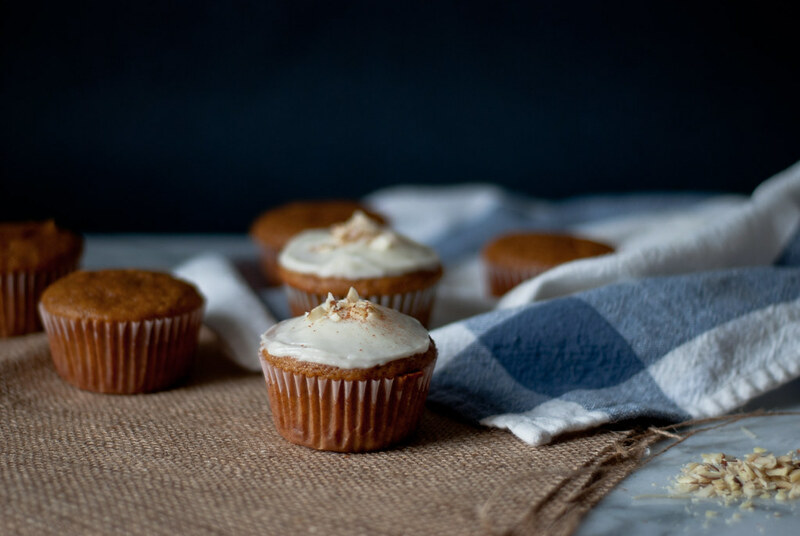 I’ve had pumpkin muffins plenty of times but I don’t think I’ve ever actually gone for pumpkin cupcakes; and with that maple frosting these look phenomenal. It really is the best feeling! And this comment came at a good time for my morale, by the way — two hours ago my kitchen looked like it had exploded (now confined to a very crowded sink) and I was holding a batch of cookies that was definitely NOT perfect. You reminded me to soldier on 🙂 Thanks for your wonderful comment, Ruthy! Let me know if you try these! Me either! I had to Google after I was mystified by those flat cupcakes. It figures, though, you’d think to reduce the leaveners if you were reducing everything else… duh. Haha. Oh NO — do you mean you tried the ones I posted?! AHHhh I hope I didn’t lead you astray! No! It was a recipe I had been developing as a cake. Then I decided to try them as individual portions, as in muffins. That’s when I didn’t realise to reduce the baking powder. Seriously, the only thing they didn’t do was explode! Ooh, I see. Still, oh NO! I feel like there’s nothing sadder than watching your baked goods go awry behind the oven door… haha. Or more comical in some cases. I’m glad they were still delicious! 6 tries! You are so determined! I’ve read that we cannot scale leavening agents proportionately, glad you got yours right, the cupcakes look divine! Or wasteful! I had almost given up because I felt like I couldn’t justify any more attempts, but luckily my dad kept washing these down with his coffee 😉 This is one instance where I’m REALLY glad it was a half-batch I was testing, or else I would have never been able to figure out the right ratio! Very very interesting about scaling leavening agents, too — that would make sense in hindsight 😉 Thanks so much for your lovely comment, Jasline! Thank you for all of the trial and error, because it looks like you really found a winning recipe for the rest of us to try! And I love that it makes 6 cupcakes. That is one of the problems with baking when there are only two of you – so many leftovers!! Such a struggle! And it’s really only me most of the time, since I’m the only one who likes sweets. But luckily I’m starting work soon, so you know that means lots of coworker guinea pigs 😉 Thank you so much for your kind comment, Catey! I hope you like these if you do end up trying them!! Way to persevere! I don’t have that much patience! My roommate teaches high school, so all my extras go to her students, they’ll gladly eat anything and everything! Oh, lucky YOU! That’s amazing! 🙂 I bet you make your roommate quite the popular teacher too. And thank you for your comment — I don’t know if I would call it patience as much as a weird, nagging sense of unfulfillment, haha. Glad I found your blog, by the way, and so glad you stopped by, too! Wow, if at first you don’t succeed, try try again! Good for you! And they look so cute and delicious! Or, at least until the can of pumpkin runs out 😉 Thanks so much for the kind comment, Jo! Those look wonderful! I’m a sucker for anything with cream cheese frosting. I wish your dad was at my house. I hate thinking about all the failed baking experiments that only make it to the trash. Heart breaking. Way to get through it to something perfect. That’s the best feeling ever! Wonderful idea! Yes, the freezer is our best friend in this little household 🙂 Thanks for your comment! I love that you recipe-developed the hell out of these gorgeous cupcakes! I’ve always wanted to create my own but there’s just never enough time. Plus, the thought of wasting ingredients freaks me out. Someday. I bought the book Ratio just so that I could start experimenting with recipes and I’ve yet to use it. These look like the perfect fluffy moist cupcakes. 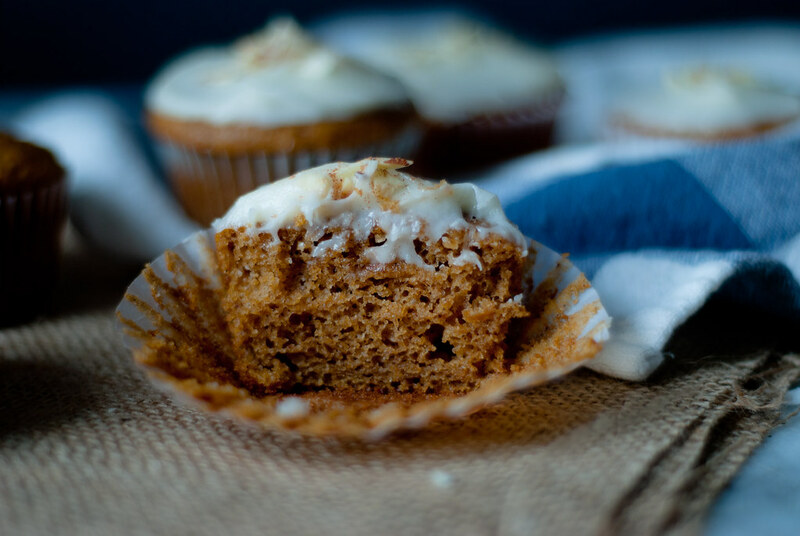 And slathered in maple cream cheese frosting – be still my beating heart (and grumbling stomach)! I just made these for our work potluck. They turned out quite good! Had no walnuts so I sprinkled some cinnamon on top. Thanks for the recipe!